Without rereading Beowulf a third time (I read it in June, after all), I can think of no magic rings. There are, of course, many objects of beauty and great craftsmanship. However, the only mangical item I can think of is the magical, used by Beowulf in his combat against Grendel’s mom after the mighty blade Hrunting fails to protect him. Later, he is given Naegling by Hrothgar in honour of his defeat of Grendel’s mom. These are about all the properly magical items I can think of just now. Here the connexions between Beowulf and The Hobbit are more slender than with the monsters. But still we have magic swords that enable their bearers to wreak terrible deeds. *Unlike the others in this series on Beowulf and The Hobbit: ‘The Epic and the Episodes‘, ‘The Monsters and the Magic: Grendel and the Goblins‘, and ‘The Monsters and the Magic: Dragons‘. **Here come in the inevitable references to Wagner and The Saga of the Volsungs, although Tolkien claims no relation to the former. ***More inevitable references to Wagner and The Saga of the Volsungs? Perhaps also The Princess Bride for good measure, right? This entry was posted in Books, Literature, Mythology, Other Poetry, Science Fiction and Fantasy and tagged beowulf, beowulf and the hobbit, glamdring, hrunting, magic rings, magic swords, orcrist, saga of the volsungs, the hobbit, tolkien on December 17, 2012 by MJH. Thus far, our discussion of Beowulf and The Hobbit has taken us to the world of genre and then into the world of Grendel and the Goblins. Now we turn from such petty monsters as Grendel, trolls, goblins, what-have-you, to the big beasts. Dragons. Beowulf has a dragon in the last, violent episode. Sadly, this wyrm is much less famous than Grendel, descendant of Cain. I think he deserves his day in the sun. So here it is. The dragon of Beowulf comes upon a barrow left behind by the men of Geatland of old, now long-dead, long-forgotten — there is a touch of sorrow in the poet’s telling of this fact; the sorrow of the fated — doomed — Anglo-Saxon. Much feared by the Geats, the dragon takes possession of the hoard then lies silent and sleeping for three hundred years, almost if not entirely forgotten. Then, one day, a wandering thief takes a vessel from the hoard, shows it to his master (Beowulf, King of the Geats?). The dragon knows. Is enraged. The fire worm flies into a rage, realising that men now know of the treasure. 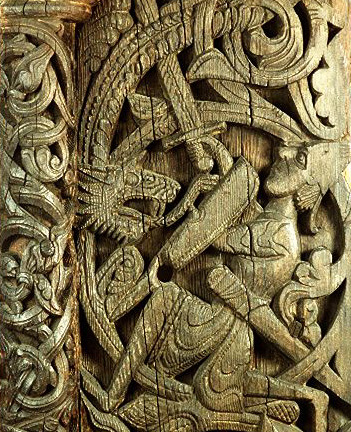 The dragon attacks the people of Geatland, attacks Beowulf’s kingdom. Beowulf did take with him 12 men, 12 thegns, 12 apostles of battle. And he did battle with the dragon, though only one of his men, Wiglaf, would stand by his lord. And, although victorious, clad in armour, Beowulf died in battle with the fire dragon. Thus the dragon of Beowulf. 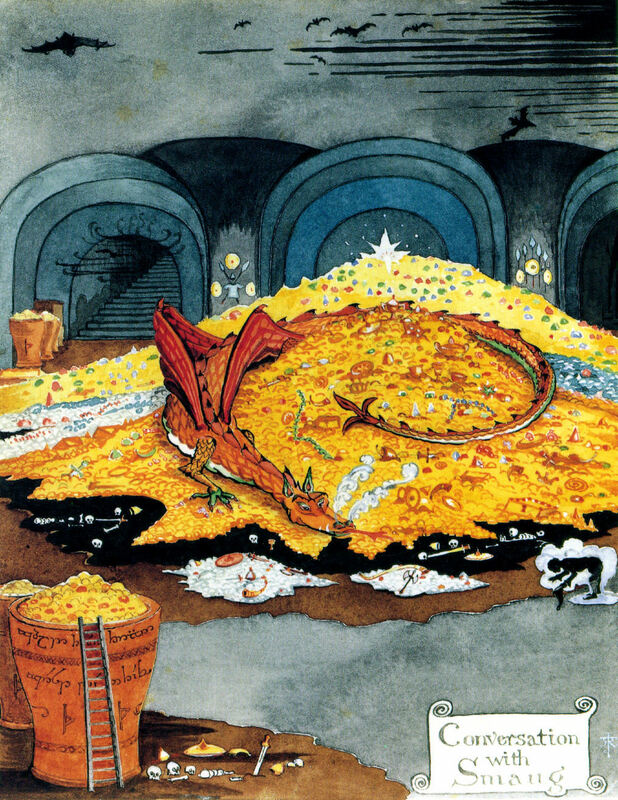 Smaug is a very similar case — although he took his hoard from the living. Nonetheless, he, too, has a precious vessel stolen. He, too, flies out in a rage and ravages the countryside. He, too, is slain by a man of valour. Look, here. Beowulf takes 12 men to defend his kingdom; Thorin takes 12 dwarves (and one hobbit) to reclaim his kingdom. In the events that transpire, Beowulf is slain; so also is Thorin. Not perfect parallels, but present nonetheless. But what do dragons represent? This, for me, is an important question. If memory serves me right, according to The Complete Guide to Middle-Earth, Tolkien’s dragons symbolise the evil within human nature. Outside of Pern or ‘Puff the Magic Dragon’ where they are good and Harry Potter where they are mere beasts, this is obvious, taken straight from Revelation and other biblical references where a dragon may represent the devil, or even from Apollonius of Rhodes’ Argonautica (although E V Rieu was very adamant in the introduction to his translation of it, The Voyage of Argo, that the beast guarding the Golden Fleece is a giant snake, for that is what drakon means). But what sort of evil? I believe that dragons are greed, avarice. Tolkien even makes reference to Smaug’s rage at the treasure burgled by Bilbo as being the extreme sort of anger only displayed by the very rich who have lost something they didn’t even know they’d owned until it was gone, but now it is very precious to them. Smaug is avaricious and sly — and so is avarice. It slips in when you aren’t looking, burns up everything, consumes you, and makes you want more, more, more. The Beowulf dragon is about the same, really, given the parallels between him and Smaug. And if we want to press home this vision of dragons as symbols of greed, I shall quickly bring in the Volsunga Saga (trans. by Jesse L Byock as The Saga of the Volsungs). In this Icelandic saga, Sigurd slays the dragon Fafnir (an event known to one and all through Wagner’s Der Ring des Niebelungen — read my thoughts on Siegfried here) Tolkien himself tells it in The Legend of Sigurd and Gudrun, on which I blogged here and here). Fafnir, brother of Otr (Otter) and Regin, has demonstrated himself very avaricious from the start, when he and Regin encounter the Aesir with the skin of Otr who was slain by Loki (naturally). He demands, as ransom (wergeld), the skin of Otr filled with gold. And then he wants the entire skin covered with gold. At last — and I believe it is Regin and Fafnir’s father who does this — a cursed ring is added to the treasure, covering the last portion of Otr’s hair. Otter’s Ransom (gold). Fafnir takes the treasure and the ring and eventually transforms into a greedy dragon. Dragons are avarice, and this allegorical/analogical/symbolic interpretation of them is perfectly in keeping with mediaeval literary tastes, since mediaeval people loved a good allegory (see Dante’s Divine Comedy or Sir Gawain and the Green Knight or Pearl). Now, Beowulf may be an early mediaeval, pre-Viking, Germanic/Anglo-Saxon tale, but it was recorded by a Christian in an England acquainted with Continental tastes — and Tolkien was no stranger to symbol, although he hated allegory. Could we not say that, although not an allegory for greed, Smaug is a symbol of greed and its destructive power in the human heart? Yes, I think so. This entry was posted in Books, Literature, Mythology, Other Poetry, Science Fiction and Fantasy and tagged allegory, beowulf, beowulf and the hobbit, dragons, fafnir, ring of the nibelung, saga of the volsungs, symbol, the hobbit, tolkien, what do dragons represent on December 15, 2012 by MJH.